Kevin Schmidt could go on and on about the programs going on at Cherry Hill Health & Racquet Club (CHHRC). He just doesn’t have that much time. As the tennis program director at CHHRC, Schmidt is immersed throughout the year in non-stop tennis action with kids and adults of all ages. Much of his summer — and the staff’s — is taken up by camps, leagues, kids clinics, USTA tournaments, USTA League Tennis, high-performance training and much more. A club that’s constantly looking for ways to improve and new programs to run, CHHRC was named a Middle States Premier Facility for 2014. CHHRC has been under the same ownership for over 30 years, which helps keep the stability and balance needed in order to operate a successful club. CHHRC’s teaching staff boasts more than 100 years of combined tennis instruction at CHHRC. Some club professionals have been on staff for nearly 25 years. The club has the ability to focus on tennis while emphasizing fitness and youth sports performance programs as well. Now in the heat of the summer, this is even more apparent. CHHRC features 13 courts. Six of the outdoor courts are bubbled and converted to indoor courts in the winter months. That flexibility allows the facility to run various junior and adult programs year-round. Whatever a player’s choice may be, the courts at CHHRC are always buzzing with action. 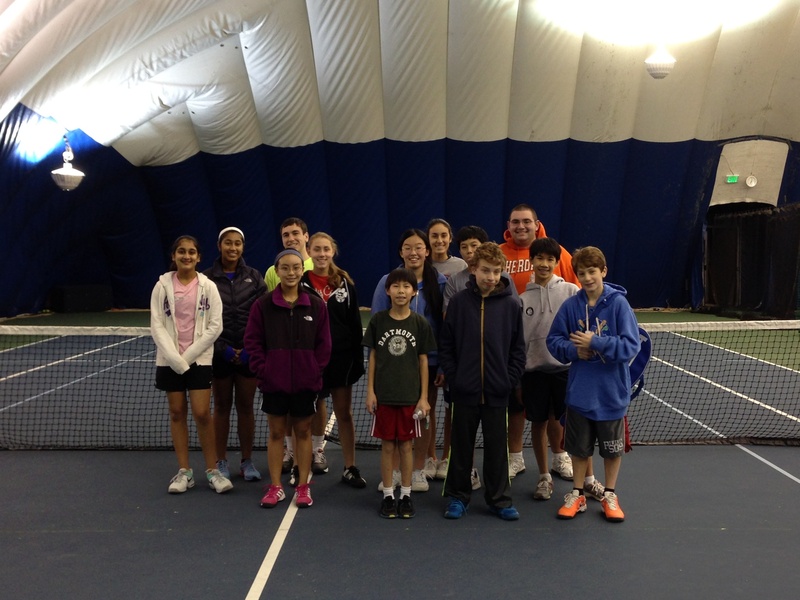 Cherry Hill Health & Racquet Club kids at a Jr. Team Tennis Play Day. Between classes and leagues, the courts see plenty of play in the morning and evening hours from adults in the area. Schmidt said the club offers programs that allow players to advance from beginner on, getting as specific and as high-level as a player could want. And even with a high demand for court time among adult players, CHHRC continues to develop and provide opportunity for young players. In fact, Schmidt said the junior programming at CHHRC is one of the club’s largest-growing points of business. Close to 50 percent of CHHRC’s kids are a part of the 10 and Under Tennis program, which starts simple and feeds players into a development stage as the kids get older. That includes Play Days, match play, team tennis and more. With that process, kids have a better opportunity to improve and get more comfortable on the court, keeping them in the game for longer. CHHRC has seen 57 percent growth in its junior program in the last two years alone and, with so many kids involved with 10 and Under, Schmidt said he’s excited to see what the next crop of junior players looks like. CHHRC has another interesting element to offer to players: one of the top wheelchair programs around. New Jersey teaching pro and USTA New Jersey District President Carol MacLennan, who teaches at CHHRC and its adult social programs, has been involved with the wheelchair program at Cherry Hill for years, and helps run players through drills each week and even organizing matches and tournaments. In early August, CHHRC even hosted the Magee Rehab Hospital Wheelchair Tournament. It all adds up to a unique, community feel that includes everyone and anyone interested in getting a racquet in their hand. Fore more information on Cherry Hill Health and Racquet Club, click here.